Beery Media » “January” in June! Beery Media is proud to present our latest short film for your enjoyment. “Stunning…A Magical Metaphor…Brilliant” – Eliza Marsalis, Film Faun NY. A chance encounter on a train changed their lives forever. 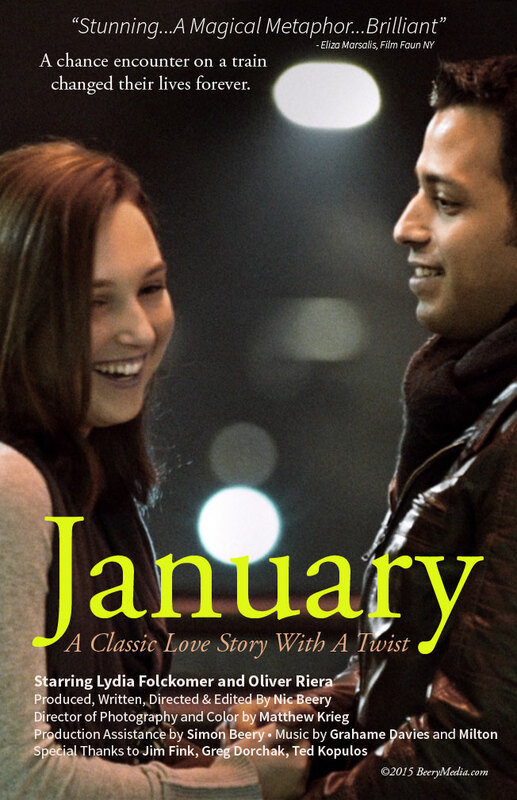 JANUARY, A Classic Love Story With A Twist. Shot over the course of three nights on Charlotte, NC’s Light Rail System, and in Winston-Salem, NC, our camera follows January and Grant as the get to know each other a little better. Featuring a unique device of no on camera dialogue, we hear the couple chatting as they end their evening walking through the late night city streets. Is it a relationship that’s meant to be? The viewer will be able to answer that question as the final credits roll. This entry was posted by Nic Beery on June 3, 2015 at 9:15 pm, and is filed under Uncategorized. Follow any responses to this post through RSS 2.0.You can leave a response or trackback from your own site.